Is The End Near For Magazines? The news on magazines is grim today, as steadily declining newsstand sales are now dropping even faster, and for the first time the number of magazines folding is higher than the number of new titles. 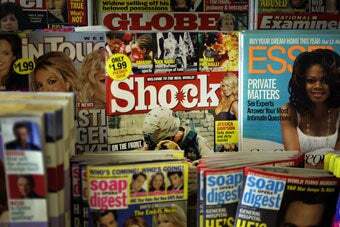 Newsstand sales among the 70 biggest magazines in the U.S. fell 31% between 2001 and 2008, according to MediaPost. Though the number of subscriptions is usually higher, the number of newsstand sales is still considered an indicator of a magazine's health. Though most titles had their ups and downs over the last seven years, the trend was clear, as newsstand sales at 55 out of 70 titles declined. Among the magazines with the biggest decline since 2001 were Glamour, down 41%; Marie Claire, Time, Newsweek and Entertainment Weekly, which were all down more than 50%; and Woman's Day and Redbook, which were down more than 65%. There were a few titles that saw an increase in sales, including The Economist (up 68%), Elle (up 14%), and men's magazines Esquire (33%) and GQ (15%). The decline is generally blamed on the rise of the internet (duh). Most magazines put a portion of their content on the web, and apparently there are some blogs that post all the juicy bits from magazines online. But recent figures suggest it isn't just the internet cutting into magazine sales anymore. The decline accelerated in 2008 as consumers decided shelling out for magazines each month wasn't an essential part of their recession budget. While newsstand sales dropped 23% on average from 2001 to 2007, they dropped another 9% in 2008 alone. In addition to established magazines seeing a drop in sales, for the first time the magazine death rate has exceeded the magazine birth rate, reports The New York Post. In the first quarter of this year, 101 magazines folded and only 95 new titles were launched. There's some disagreement over the numbers, but according to Trish Hagood, president of Oxbridge Communications, which publishes the Standard Periodical Director and the National Directory of Magazines, the number of new titles is on the decline. "Other than entrepreneurs, people are definitely being more cautious with launches," said Hagood. Clearly the recession is taking a toll on sales across the board, but can the steady decline in magazine sales actually be blamed on the internet, or has the quality of their content been declining too? Is the internet now satisfying your need for magazines, or do you still yearn to flip through their glossy fluff-filled pages ?